» PC Reviews » Xotic PC Review, Are These PCs Overpriced & Under Built? Xotic PC Review, Are These PCs Overpriced & Under Built? It’s time to review Xotic PC to see if their custom PCs are actually worth getting. Let’s look at the hardware piece by piece and see if the value is there. Does A $1,000 Xotic PC Deliver? For the first part of reviewing Xotic PC (xoticpc.com) I’d like to see if it’s worth spending $1,000 to get a PC configuration done. I decided to look at the G4 Triton since it’s priced right at the $1,000 mark. Most people looking to have a high-end system will be looking to spend this much or a bit more to get the highest quality gaming experience possible. After clicking the desktop it takes a while to get into the actual hardware behind it. Xotic focuses on hyping up the desktop a lot before check out which I suppose that’s what a sales page is meant to do. Oh well, might as well read up on what Xotic has to say about it. The page explains how this PC is VR ready, is easily upgradeable and has awesome liquid cooling. Sounds like a good deal, right? We can only know after taking a look at all of the hardware that’s really inside of it so let’s get down to it. These specs are not at all worth $1,000. Reason is because you can literally do a build with similar specs for just a little over $500, completely built. Going through the process of buying the PC… I don’t feel any sense of transparency going on. I figured maybe I could customize it a bit and see what else I can change around with it, see if making some changes would help with the pricing a bit or maybe the liquid cooling they talked about is top notch. Turns out that the liquid cooling isn’t even included with the build – you have to pay for an expensive $530+ upgrade to have the liquid cooling that is pictured with the desktop on the sales page. What’s also stated on the sales page is that the video card is “VR ready” and the PC is easily upgradeable. I can definitely see how the PC would be easily upgradeable, but that’s with any PC build really. Anyone can upgrade their PC with different parts. But to state that the GTX 1050 Ti is a “VR ready” graphics card is kind of a joke. Sure, I bet it could handle the lowest end games… But if you’re looking to play with 90+ FPS on bigger titles then you’re going to have a bad time. The GTX 970 is roughly 70% more powerful than the GTX 1050 Ti and the 970 had some troubles with stuttering in VR. I know this from trying to play with the Vive with the 970 as well as reading up on other people’s experiences. The 970 is stated as the minimum requirement for VR. I just feel like Xotic is purposely knowing that their systems are overpriced or maybe they really don’t know what the power is actually like. Do the math, Xotic is making roughly ~$400 profit off of this PC. That’s a ridiculous amount of profit, even with their warranty policy and employee payments being factored in. Most pre-built PCs you find on other storefronts will make about $150-$250 profit from the build which, depending on the build, I can see where that is fair. If you go on EA’s Origin store right now and look up both titles you’ll see that Battlefield 1 costs $40 and Titanfall 2 costs $20. I’m not a fan of how they are presenting this build… They show the liquid cooling inside where it says the desktop “starts at $999” but you have to upgrade to it and they are also trying to sell games for way more than what the official store sells them for. I’ve never seen a custom PC website that costs so much while also selling accessories and games for so much more than what they’re worth… You can tell that this company is more so about the money rather than providing real value. Alright, Can They Deliver On A $2,000 Build? I don’t want to conclude my review saying they’re a complete rip-off without looking at the higher end as well. Maybe for some reason they have troubles with profits at the lower end so they have to be overpriced there. There’s only one way to find out so let’s take a look at the GX13 Intruder – more specifically the one using an AMD Threadripper CPU. 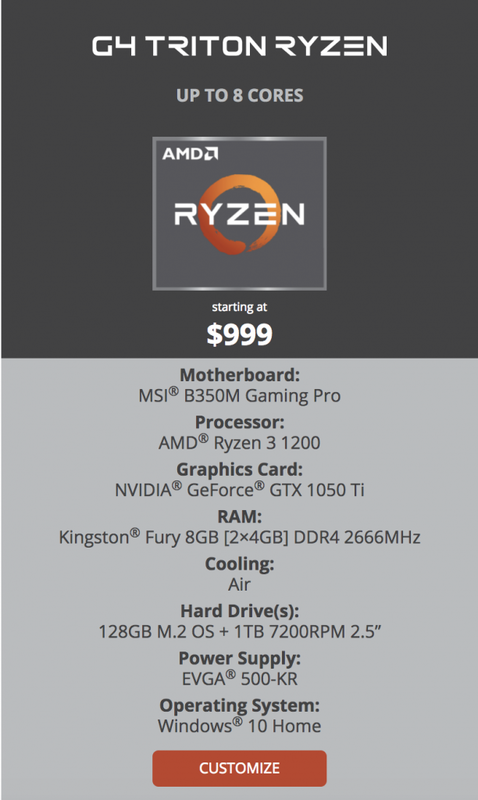 It’s stated that it starts at $1,269 which includes the same exact specs as the $1,000 PC… A Ryzen 3 1200 CPU and a GTX 1050 Ti. But let’s take a look at the Threadripper configuration to see what it’s like. Let’s see if it’s worth $2,229. This is where I’m actually upset with what I see. A custom PC that costs over $2,300 and it’s still using a video card that is more suited for a $500 build that’s meant for 1080p gaming?! At this price point you should be able to game at 4K right out of the gate. Virtual reality gaming should run at a smooth 90+ frames per second at all times… This is one of the highest end price points for a PC yet a high end video card isn’t included. Getting this build as is would result in you still not being able to game at 4K, I wouldn’t even want to try VR gaming with a GTX 1050 Ti since the experience wouldn’t be what it was made for anyway. I’d also like to mention that this PC is marketed as a “gaming” PC yet they want to use the Threadripper as the CPU. Yes, the Threadripper is a great processor and it’d do fine in gaming but it’s not marketed from AMD as a gaming processor. If you wanted a workstation PC then I could see why you’d use a GTX 1050 Ti along with the Threadripper since most rendering wouldn’t utilize the graphics card as much so you could save money there. If that’s your plan, please do a build of your own and save yourself a ton of money. Seriously, I’ve looked over plenty of companies that provide pre-built PCs and I don’t think any of them are as much of a rip-off as Xotic PC is. I’ve always preached that, for the most part, you should never buy a pre-built gaming PC and these types of configurations proves my point. Even looking at these configurations in a way where the video card is meant to be changed during the customization phase you’re still getting ripped off big time. All in all, I’m not a fan of Xotic PC. Even with their 2 year warranty and the policy where you can send you PC in to get an upgrade whenever… The support the provide in general still doesn’t justify the crazy prices they are charging. I like a company that is transparent, especially when it comes to a company that wants to sell gaming PCs. Going through these sales pages I simply felt like I wasn’t being told/shown exactly what I was getting into. I highly suggest looking into doing a build of your own, take a look at a $500 build guide to start off and go from there. You’ll save yourself a lot more money and you’ll get the actual performance that you deserve for how much your spending. This marks the end of the Xotic PC review, what do you think? Do you think the builds are overpriced? Or do you see the value in the support you get from the company? Tagged custom gaming pc, pre built gaming pc, xotic pc. Bookmark the permalink. 10 Responses to Xotic PC Review, Are These PCs Overpriced & Under Built? Hi Colten, although I have never heard of the Xotic PC, it is good to know they are not a recommended site, as I have been thinking about building my own PC in the back of my mind for quite some time now. I’m not very mechanically inclined, always have been working with cars and such. Do you think that due to this, I would struggle to build my own PC? I know that someday if I really want that gaming experience I have always dreamed of that I would have to build my own PC, but have always kind of backed off due to the expenses. I mean, $1K is a lot of money to for me to spend, although I have also heard that spending just $300 will net you a PC that is just as powerful as a PS4/Xbox One. What do you think I should do if I were to start learning the components and all the other variables I need to know to start learning how to build a PC? Right, it’s good to be aware of the performance power per dollar spent. You can optimize it with a build of your own much better than most pre-builts like what is shown here. With my first build I had no idea what I was doing but putting a PC together isn’t as hard as most think. I’d recommend checking out this page to get an idea of what budget point you’re wanting to use and then there is plenty of material to help you out, as well as me! Thanks for a good review of Xotic PC. This is like a PC Build with upsells and it shouldn’t be like that. I tend to agree with you that they shouldn’t be using that CPU, especially since the price is high-end. I don’t like how they are not being transparent here and also charging $70 for shipping? It’s like they are trying to squeeze every last drop. What would you recommend as a better alternative in the $1000 range? I’d recommend going with a PC build of your own, I can help you as you get it put together! Check out the $1,000 build guide here on the site! These computers are definitely way too expensive for what they claim they can do.There are cheaper versions out there so you have to look around. I suppose you have to take into consideration if you are using the machine for gaming or just general internet surfing as the specs can be modified depending on what you want. Right, even with the modifications that you can do you’ll still be overpaying by quite a bit. 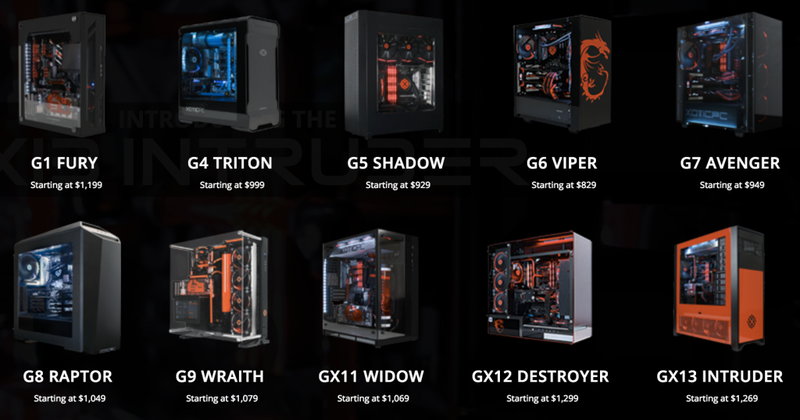 I have no doubt that the build quality is good but when it comes to a pre-built from a company like this you’re going to be paying a whole lot more versus what it’d cost to build a similar PC yourself. I’m not aware of anywhere that does custom laptop builds Lynn, though I wouldn’t recommend going that route anyway. What kind of laptop are you in the market for? I could probably find a good one for you? I am writing as, what started out, a satisfied return customer to XOTICPC. Sadly, this is no longer the case. The company has slipped under its new management. The slips include but are not limited to quality control and customer service. XOTICPC advertises a testing program for each computer which involves repetitive testing of each component under high stress. However, this testing somehow didn’t reveal a glitch involving the video card and missing software that I discovered upon my first use. I spent the next seven weeks trying to work with the XOTICPC service department over emails and phone calls to troubleshoot this machine. BTW, XOTICPC also advertises email customer support 7 days a week. This is NOT true. When I sent an email even minutes after 5:30pm on a Friday, it would be sometime Monday before I would get a reply. After the seven weeks, the XOTICPC service representative admitted that the machine needed to be sent back to their facility, I was then informed that I was responsible for the risk and cost of shipment. This was because XOTICPC managed to delay this action well outside the 15-day warranty window, per XOTICPC policy. I brought this issue up to the current general manager, Seth Montecuollo, asking for exception. He wrote back, “These are terms that are upheld whether you are purchasing for the first time, or a return customer; whether you have reported a potential warranty issue on day two, or on day 45. The same terms would also apply if you were troubleshooting an issue at the end of your warranty”. In other words, XOTICPC can and does control the customer’s ability to receive or lose warranty benefits by simply delaying the issue of a Return Merchandise Authorization (RMA). In the case of Seth Montecuollo, it seems like a point of pride. Seven weeks without coming to a conclusion on getting it sent to them and getting everything fixed up? That’s crazy! You’d think they’d purposely help out if it took that long to keep you as a happy customer… It’s unfortunate to hear that you had to go through this struggle with them.